We’re not sure what to expect as we arrive at RISONARE Tomamu, the hotel we’re booked into for the next three days, but we’re certainly not expecting a flute performance. Moments after stepping off our bus from Sapporo’s New Chitose Airport, we’re being welcomed into an spacious hotel lobby as a flautist serenades the hotel’s new arrivals in the background. Nothing about Tomamu is quite what we expected, and if travellers to the resort think they’re arriving simply for a ski holiday, they may be in for a surprise – albeit a positive one. No detail of the guest experience has been left to chance, and there are attractions and activities to entertain virtually any type of traveller. We’ve heard lots about Tomamu’s appeal for family ski groups – its groomed runs, ski schools and convenient facilities – but it doesn’t take long to realise that the allure stems well beyond all that. For a start, the skiing is surprisingly varied, with expansive green and blue runs to suit riders at the beginner/intermediate end of the spectrum. This much we expected. The ski area is moderately sized by Japanese standards, with one gondola and five covered chairlifts servicing more than 21 km of runs. What isn’t so widely discussed is that there is also some seriously good tree skiing and sidecountry for advanced skiers who have come to Tomamu for the “Japow”. Better yet, Tomamu’s reputation as more of a family resort means that powder hounds are not exactly queuing up at first chair to get their share of fresh snow for the day. We have timed our arrival in Tomamu between the end of the Australian school holidays and the beginning of Chinese New Year, and the upper slopes of the mountain are mostly deserted. At many resorts in Japan, a day’s skiing might be followed by an onsen and a low-key Japanese meal. where skiing is very much the focus of the holiday. In Tomamu, there’s enough going on to satisfy everyone: non-skiers, part-time skiers, foodies and children. Picking out a plan of action for the day is part of the experience. On morning one, I go in search of fresh snow as my partner takes some time away from the nagging pain of her ski boots to check out some of the resort’s extras. She wonders into Mina-Mina beach – an imposing sight for for anyone in the grips of central Hokkaido’s sometimes bitterly cold winter. The indoor beach has one of the largest wave pools in Japan, and is heated to 30°C through the winter, offering welcome relief to skiers coming from the mountain. Naturally, it’s also very popular with kids and families, who can choose simply to swim, or to try stand-up paddle boarding, slacklining, or spinning around in a giant blow-up “cyber-wheel”. A float in the pool is the perfect antidote for Angelina’s tired muscles (we’re well into our Japan trip at this point), before she retreats to Risonare’s library-style café for a coffee and some quiet time with a book. Later, she meets me in Tomamu’s Hotalu street, a speciality dining area of the resort that runs parallel to one of the beginner chairlifts, and has been designed so that visitors can ski virtually to the door of any of its eight restaurants. 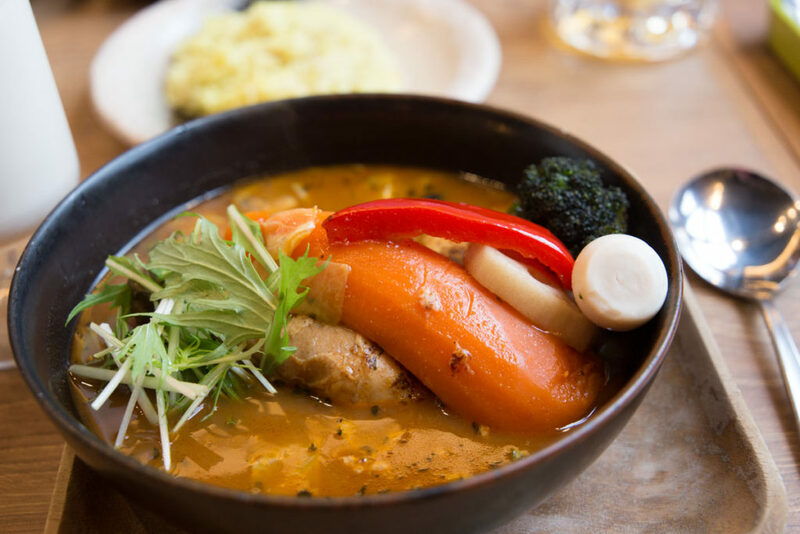 On this occasion, we have chosen to meet at Garaku, where we devour piping hot soup curry – a Hokkaido specialty made with a spicy curry base, chicken, and locally-grown vegetables – which we wash down with ice cold Sapporos. It’s a favourite Japanese meal of ours, though we feel somewhat burdened by choice, with other options in Hotalu that include a seafood restaurant, local deli, ramen store and steak diner. Tomamu takes its dining very seriously, which is something that any foreigner familiar with the overpriced food often found in international resort will appreciate. There are a staggering 20 restaurants to choose from, which are spread across its two hotels (Risonare included), the mountain, the resort centre, and Hotalu street. The restaurants span a multitude of cuisines and cooking styles, but the common theme is a focus on fresh, locally grown ingredients. In the mornings, we head to Platinum on Risonare’s 32nd floor, for a buffet-style breakfast, views of the ski resort, and its famous French toast. In the evenings, we take the shuttle bus to Hal restaurant in Tomamu’s The Tower hotel, where we gorge on crab, salmon and other seafood delights. On day two, I arrange to go on a backcountry tour, which is organised through the resort. It is an easy choice for me, and I am keen to see what the surrounding areas can offer skiers looking to escape the resort boundaries. Naoto-san is my guide for the day, and with the weather closing in, he has elected to me to a mountain called Takenokoyama – a 45-minute drive from the resort. Local knowledge is an essential part of negotiating the backcountry, and today Naoto-san has chosen a spot that is protected from the wind, and under the cover of trees to keep visibility to a maximum. A 2-hour hike takes us up moderately-pitched terrain and through gorgeous birch forest, before we turn, drop in, and reap the rewards of our efforts: bottomless, light, dry powder. There is not another skier on the mountain. The ski to the bottom is perhaps 20-minutes, but they are the kind of runs that remain etched in your memory long after a ski trip has finished. We arrive back at the car in time for lunch at our next stop: a local ramen restaurant serving burnt miso ramen with a distinctive black broth and local pork. Moments later we are feeling satisfied and rejuvenated from the hike. Naoto-san then takes me on a drive to see the entrances to several other areas that he frequents regularly, which include Sandan-yama, Sanpo-zan, Mae Tokachi-dake and Furano-dake. It is a serious arsenal of guiding destinations, and as he shows me countless images of himself and friends skiing up to their shoulders in blower powder, I get the sense that these incredible days are his bread and butter. We end our day with soak in the rotenburo at one of the trailheads entering Sanpo-san, a relaxing finish to an enjoyable day. As I arrive back at the hotel and farewell Naoto-san, I tell myself that I’ll be back to explore the area more next year. Meanwhile, Angelina has been back at the hotel with a plethora of activities to choose from. She has decided to spend the day cruising Tomamu’s many intermediate groomers – to which she gives a big “thumbs up” – but had she elected to spend another day off skis she would have had any number of options. Tomamu offers snowmobiling, snow buggy tours, banana boat rides, snow rafting, snow shoeing, night picnics, ice fishing … the list goes on. If you’re bringing little ones with you, they’ll love the snow sled park or the snowmobiling for kids – which uses a smaller, less powerful sleds. Foodies will enjoy making Baumkuchen – a type of German split cake cooked over a charcoal fire, while the artists in the group can try their hand at White Birch spoon making. Our two days in Tomamu have so far been filled with action, but its night are equally eventful. A significant part of the mountain is kept until 7 pm for skiers and snowboarders who want the experience of skiing under moonlit (and floodlit) skies. We have been advised to head to Tomamu’s famous Ice Village, which is a stunning meandering maze of fluorescent lights, sculptures, slides and ice huts, as well as an ice skating rink. Each of the huts contains something new, and we make our way through ice bars, ice shops and and ice library (yes, really). Eventually, we come to an ice chapel (it commonly hosts weddings), which sits adjacent to an ice hotel – a single room with a large bed in the centre – which we sincerely hope isn’t the first port of call for the newly-wed couples! We are, however, told that no one has ever had to leave the hotel mid-way through their stay. Our final day arrives, and for us it means a quick breakfast at the Forest Restaurant Nininupuri and a morning ski. We have, after all, come to Tomamu for the skiing, and with all the exciting distractions it is almost easy to forget this. With 15 cm of fresh snow overnight, Tomamu has given left us with a parting gift, which is not uncommon for a ski resort that gets more than eight metres of snow every season. As I do lap after lap on a chairlift called the Powder Express, ducking into the trees to the skier’s left of Moonshine, I come to the conclusion that Tomamu may be Japan’s best family resort – not because it caters well to children but because there is something for everyone. Kids, teens, parents and grandparents would all have a ball at this resort, as would skiers and snowboarders of any ability. RISONARE Tomamu is one of three hotels in Tomamu, and one of two owned by Hoshino Resorts, the resort operator. It is an all-suite hotel at the premium end of the market; every suite in the hotel is at least 100sqm and all come with an in-room spa bath and views overlooking either the resort or the surrounding mountains. Guests of the hotel can make full use of its facilities, including the ski and rental shop, kids room and restaurants (breakfast is included in the price of the room). Guests also receive complimentary access to some of the resort’s major attractions, including Mina-Mina beach, the Ice Village and the Unkai Terrace, which overlooks Tomamu’s famous “Sea of Clouds”. Learn more about RISONARE Tomamu. Tomamu is located within striking range of three major airports: New Chitose Airport (outside Sapporo), Tokachi-Obihiro Airport and Asahikawa Airport. The simplest way to get to Tomamu is by shuttle bus, which can be taken directly from either New Chitose Airport, Sapporo or Asahikawa. The service is offered by a company called Hokkaido Resort Liner, and needs to be booked at least 9 days in advance. Tomamu is roughly an 80-minute train ride from Minami Chitose station, which is one stop from Sapporo’s New Chitose Airport. Guests arriving at Tomamu station can arrange for a transfer to their hotel at the resort, which is only a 5-minute drive.